Geriatric Nursing Researcher Kicks Off Minneapolis Creativity & Health Collaboration - Kairos Alive! Minneapolis, MN, May 1, 2017 – Kairos Alive!, a pioneer in participatory art and the creative arts and aging movement, in partnership with Centro Tyrone Guzman, are hosting a series of free all ages and abilities creativity and health programs, May 18th and 20th, featuring Adriana Perez, PhD, professor in the Nursing School, University of Pennsylvania. Perez’s research focuses on addressing health disparities in underserved populations, particularly among Hispanic women. Her research has been published nationally and internationally. Kairos Alive! is just starting a unique 1-year Community Arts and Health™ Residency at Centro Tyrone Guzman. Perez is planning to base some of her new research at Centro during the residency to measure effects of Kairos Alive! creative engagement programs to effect health outcomes. Centro Tyrone Guzman, led by Roxana Linares, is the oldest and largest multi-service Latino organization in Minneapolis, serving more than 7,000 individuals annually through a holistic array of programs that contribute to the wellbeing and full participation of Latinos through education and family engagement. enjoyment, health, and family and community connection. This is a great way to get families together. Kairos Alive!’s research-based work, featured in the PBS documentary, Arts and the Mind, is not just fun. It also encourages personal and community breakthroughs in physical, emotional and social health. Kairos empowers elders, their families, organizations and communities to adopt new ways of healthy living, and promote intergenerational inspiration, mentoring and coherence. To date, six Master’s theses have been based on Kairos’ work. Free and open to the public, family and dementia-friendly. A conversation with Adriana Perez, PhD, U of Pennsylvania School of Nursing, Gary Oftedahl, M.D., Roxana Linares, Executive Director, Centro Tyrone Guzman and Maria Genné, Founder and Director, Kairos Alive!. Light refreshments served, RSVP to [email protected] to assure a spot. 8:05-8:45 Conversation: Dr. Perez, Genné; moderator Gary Oftedahl, M.D. Dancing Heart™ is a nationally recognized, evidence-based participatory arts program that uses dance, music and story to engage people of all ages and abilities. This places older adults at the center of joyful community life, and has shown to positively improve the wellbeing of participants. Panel discussion is intended to summarize the scope of current Arts and Health research on the ability of dance-based programs to affect elder health, Dr. Perez’s research interests and discoveries, and stories from Kairos Alive! field work at Centro and elsewhere. Panel moderator, Gary Oftedahl, M.D., is an independent consultant and collaboration catalyst, former Chief Knowledge Officer for 13 years for the Institute for Clinical Systems Improvement, and Kairos Alive! Board Chair. 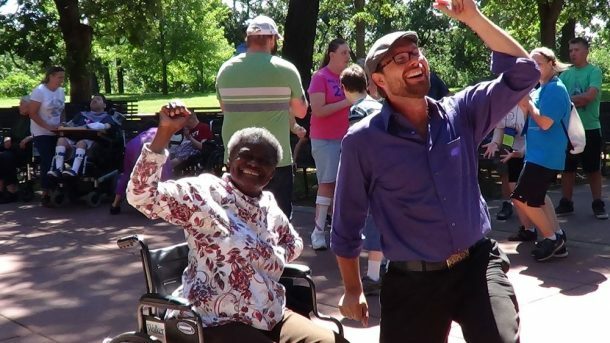 This event is our highly-popular all ages and abilities family friendly revival of the dance hall as the community intersection of artistic, physical and social involvement – designed for all ages and abilities, with elders at the center. These joyful intergenerational, intercultural events are intended to promote arts participation, health education and community wellbeing. Partial funding for these events comes from a Minnesota State Arts Board Operating Support grant thanks to a legislative appropriation from the arts and cultural heritage fund. Kairos Alive! is a performing and arts education organization that empowers elders and their community to build healthier lives through dance, music, story ­– and the latest arts and health research.